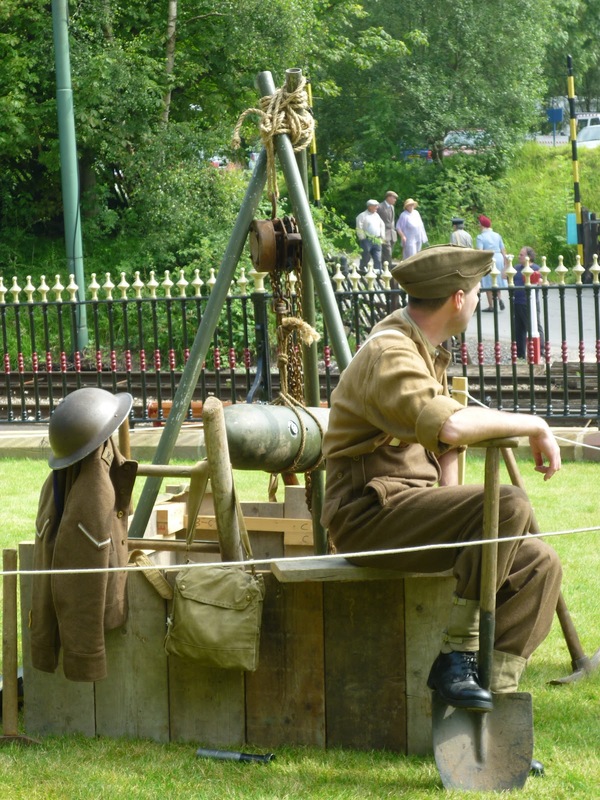 For the first time re-enactor, it can be hard to know what to expect when attending re-enactment. I've only ever attending on my own (rather than as part of an organised re-enactment group) but I imagine a lot of the experiences are similar. Here are some things to be aware of before you attend. 1) If you attend in costume, people will most likely want to take photos of you. Often these are amateur/hobby photographers, sometimes there will be professionals from whom you can purchase pictures. I will be talking in more detail about photography at re-enactment in a future post, so stay tuned for that! 2) You do not need to be able to act, or portray a character. Re-enactors represent a particular period in history and may take part in battle re-enactment or other staged scenes (mostly those who are part of organised groups), but otherwise it's enough to wear the look of the period - and probably to know about the history if you are demonstrating or exhibiting. 3) Sometimes there is an opportunity to go shopping. If you want to shop, then you usually have to bring cash as not all sellers accept card payments. 4) There are sometimes restrictions imposed by the venue as to what you can wear. For example, some disallow German army uniforms or desert uniforms. I have never been to an event where there have been restrictions in place on civilian clothing, but it is sensible to check the website for the venue or event beforehand, just to be certain. 5) If you are planning to stay all day, either make sure there is somewhere to buy your lunch or bring something with you. Most of the places I have been have had a cafe at the very least, but these can get very crowded so I usually prefer to take sandwiches. For extra authenticity, I usually like to bring wartime food. I often wrap it in greaseproof paper and carry it in my basket. 6) Some venues charge entry, others don't. This information can usually be found on the web. Sometimes a discount is offered for those in costume. 7) Check the weather forecast. Not all venues have somewhere to shelter if it rains. These are the main things that come to mind that should give new re-enactors an idea of what to expect prior to attending. Please feel free to get in touch if you have any questions or have anything that you think should be added to the list! You can find the rest of my series of posts about 1940s re-enactment here, or you can check out my re-enactment tag for photos of events. I think one thing that might be useful for people to know is, there is always one person ready to pick at any fault. For some bizarre reason there are people (we often call them stitch counters) who like to point out the floors in other people's impressions in a rude manner or make their own impression appear better to yours. This is always the minority and tbh, they're idiots. We all start somewhere. But most of us are genuinely friendly and always ready to help with improving impressions. It is a hobby at the end of the day. :) Don't let them get to you. But good list. :) Getting me really hyped for the season now! Very interesting post, especially for those like myself who have never had the great fortune (but have long wanted to) attend an event like this because there simply aren't any around where we live. I was thinking about the same point that Ieuan raised, as I've heard many reeanctors discuss it online and to a certain degree, I've also see it happen (occasionally, thankfully!) in the vintage fashion world as well. I really hope that people haven't ever tried to get nitpicky with you and your lovely ensembles, dear gal. I think it's lovely that you wrote this informative post. People often forget how daunting it can be to go to a new type of event - especially in costume! It's nice to read some reassuring and sensible tips. I'm not aware of any events in my area, but I know I'd be tempted but nervous if I heard of something.